Thai actress, Chompoo Araya A. Hargate (อารยา อัลเบอร์ต้า ฮาร์เก็ต) was invited to Miu Miu Fall/Winter 2013 fashion show held during the Paris Fashion Week on March 6, 2013. 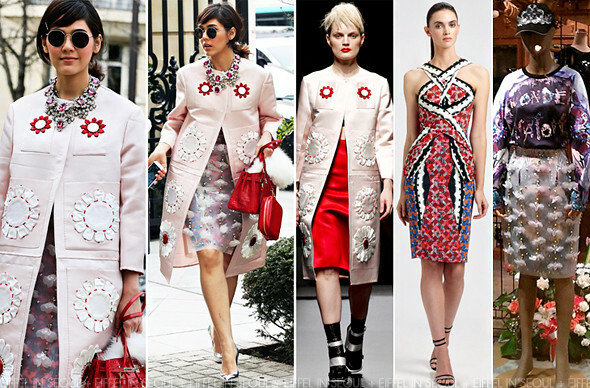 The stylish actress wore a Peter Pilotto 'LF' dress under a pink floral coat from Prada Fall/Winter 2012 collection. What's interesting about her look is the slightly transparent embellished tassel skirt she wore over the dress, from Thai designer, Wonder Anatomie. While I am unsure of the material of the skirt, it certainly looks like it's made of silicone. Her look was accessorized with metallic silver pumps, Prada necklace and red crossbag which she held with a red Hermès 'Birkin' bag. I absolutely love the styling, definitely street style worthy! It's a shame we don't get to see the beautiful dress. Disappointed to see the Prada coat on the floor (see image below).